I’ll start off with my main takeaway, which has not much to do with the internet of things per sé, but might help in working on internet of things related topics in the long run. I found it reassuring to hear more people expressing concern on how we go about with the work we do. I talked to new and old faces, who were looking for genuine engagement in topics they care about. Begone superficial chatter, time to step knee deep in the mud and take up accountability for the work we don’t seem to be doing. I had excellent chats with Albrecht, Alexandra, Andrea, Harm, Iohanna, Iskander, Kars, Marcel, Nathalie, Simon, Simone and Thomas. I hope that I’m safe to say that most of these chats will the lead to some form of collaboration. I find it important to mention these people by name, as it is them that take up personal accountability to get work done. For sure, everyone operates within an organisational or company context, but I think we’re too often undervaluing the importance of the people who (want to) care on a personal level. In my experience, people attending ThingsCon events tend to engage on a personal level, in a very critically constructive manner. I appreciate that, more than ever. When it comes to thingscon content, there were two talks that stood out for me. Firstly, the talk by Tobias Revell and secondly Iohanna Nicenboim‘s talk. What I liked about Tobias’ story was his usage of the black box as a methaphor. Over time, we – consumers – have become used to black boxed products. Things seem to work ‘magically’, we are not confronted by the complexity of technology. As time progresses, our black boxes become larger and more opaque. Also, the edges of our black boxes become blurred. I was truly inspired when Tobias mentioned these blurred edges, it gives me an excellent visual methaphor to frame some of my own thinking a lot better. When Iohanna took the stage, I laughed wholeheartedly when seeing the movies she made together with The Incredible Machine once again. It was a pity not that many people seemed to get the joke, I strongly suggest you watch the movies again in your own time. I love them because of their super critical stance and their high concentration of subtle humour. 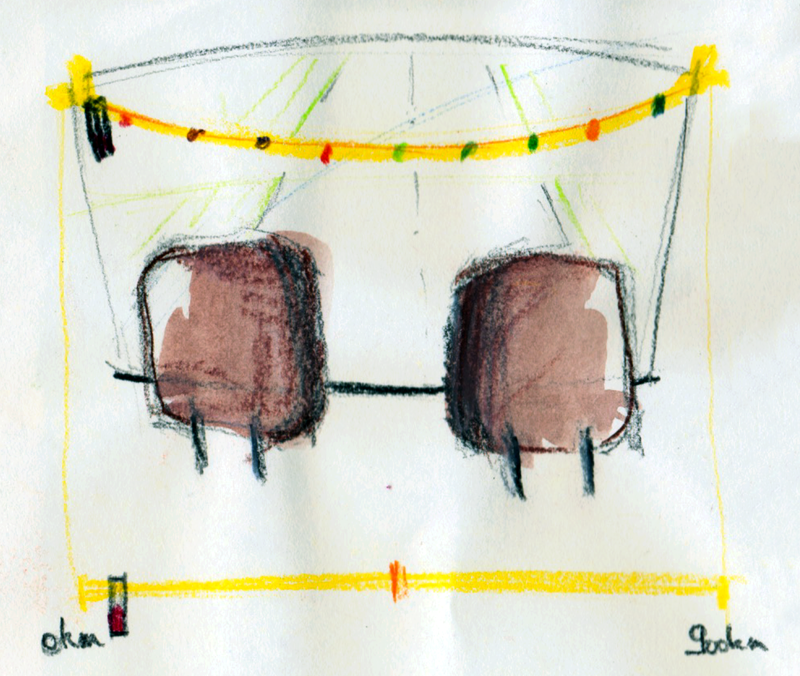 Iohanna’s ‘objects that withdraw‘ was probably the project that resonated with me mostly this ThingsCon edition. In this project, generative design is explored from the thing point of view. By adding some parameters to the model of an object, each time that object is produced it will be a little different. By doing so, things ‘hide’ themselves from digital surveillance systems. I like this project, because it totally stretches my frame of reference on mass customisation and digital fabrication. In Iohanna’s work, the goal is to hide from surveillance systems – but I could also imagine that based on a set of variables objects could themselves decide to aesthetically change their appearance in order to better blend in with the location they are used in. For instance, a mug printed in Pune (IN) might look totally different compared to a mug printed in Lyon (FR). However, the foundation of the 3D file needed to print the mug might be the same. (This starts to sound like Bruce Sterling’s spimes on steroids). 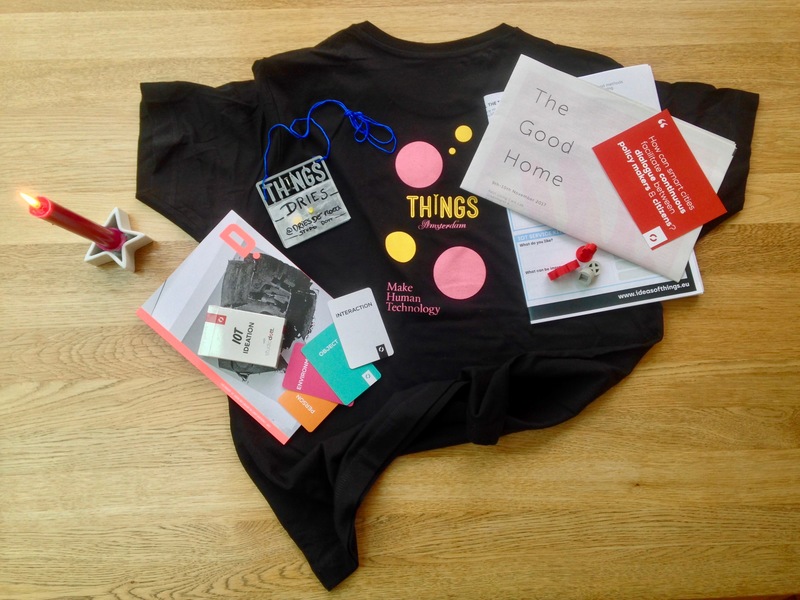 Besides all that, it was very nice to unleash www.ideasofthings.eu upon the thingscon horde. This has been a strand of thought in the heads of myself, Ricardo and Simone for many months. Finally I went ahead and put in the time to create a quick bit of online presence. Seems to be have been well received, and we’ll keep on expanding on this in between other things. 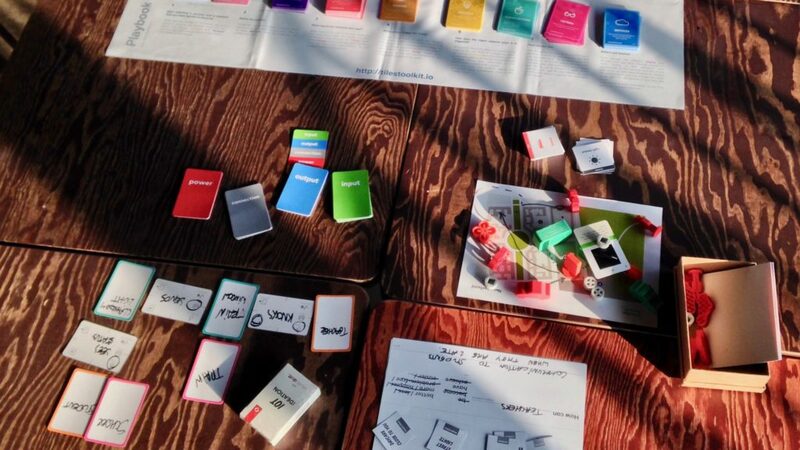 We launched ideasofthings as part of our workshop “battle of the IoT cards” in which Simone Mora and myself introduced participants to several IoT ideation tools. The goal of the workshop was to have a critical conversation on the values of each of these tools. I very much enjoyed this, it has been a topic I’ve been working on for years – so taking a reflective stance felt very good. Snapshot of the tools that were up for battle during the workshop. Arriving home from a conference like this always gives me mixed feelings. You feel super energised, but as always, the challenge is to keep the vibe alive when going back to business as usual. This time there are some promising plans in the pipeline, one of them related to the ideasofthings.eu initiative – in which we want to get together with a small group of people to dissect the ‘ideation for IoT’ theme better. Secondly, Rob Van Kranenburg introduced a relevant EU funding source. I very much want to get people together and set up collaborative projects. If I can achieve some steps in making those two elements reality by next year, I’ll be more than happy. “A lot of people involved in developing, applying or teaching about technology experience an unease with the status quo in how we apply technology in practice. A critical element is that lots of business models, financial and political structures around technology aren’t working in the interest of individual people. After talking to several people in different industries and after being involved in the organisation of a couple of events in the past year, I figured it was time to jot down some thoughts on what I’ve been noticing in social circles around me with regard to taking up responsibility and commitment. In recent months I was involved in setting up a chibelgium.be event and I had the ambition of hosting a thingscon event tomorrow (which I cancelled today…). It was the organisation of these events which taught me a lot about how social ‘standards’ seem to change. With this ranty bit of text, I have the intention to stand up and ‘do my part’. Call it whatever you want, FOMO, keeping options open, … it seems to be the social default to not commit to anything. What happened to genuine interest? What’s up with the extreme cases of ‘what’s in it for me’ attitude? It disgusts me to see so-called “successful” meetup events ending up having over 50% of no-shows because people do not treat the RSVP button with respect. I can get evenly agitated by ‘if need be’ meeting polls, they seem to be nice at first – but to me they’re often just ways of brining a “negative” message wrapped in a wrapper of vagueness. The odd thing is that I often catch myself posing the same kind of behaviour. Our online presences are making it so easy to hide behind ‘read receipts’, ‘I’m interested, keep me informed’ buttons. I try to be very cautious about communicating clearly if I can be at an event, a meeting or whether I’m willing to contribute and what the content of that contribution will be. But it requires conscious attention. In a WNYC interview with Esther Perel, the roots of the issue I’m trying to touch upon are being talked about in a crystal clear way. Our current ways of communication are making it easy to put on our capes of invisibility, and phase in and out of social interaction when it seems fit, whenever our own personal interests or needs are high enough to interact with others. When organising something, you openly take up accountability for doing something. What I notice is that the act of doing that is heavily under respected. Our social default is to nag at how everything could have been better or different, but when asked to suggest or commit to improving something … the capes of vagueness get shrouded quickly. Whatever the situation, however, getting a “full yes” or a “clear no” is worth so much more than a vague … maybe / I’m not sure. I hope that we can somehow start to turn this around, and all together escape from the shallow version of social interaction through likes, retweets and double blue tick marks. At least, I will keep reminding myself to refrain from doing that. A few weeks ago, my wife and I were preparing for our yearly drive to the Austrian mountains. I have been going to Austria since I was 9 years old, and have kept going back (to the same place) ever since. Arriving over there feels like arriving home, and usually results in a big family reunion. We sometimes go in winter for skiing, and sometimes we go in summer for sun, water and walks. Since our oldest daughter was born, about 6 years ago, we have been making the most out of the 900+ km drive there and back. This usually comes down to a big stack of CD’s with (mostly) parent-friendly children’s stories and music (this year’s favourites were Kapitein Winokio, Kabouter Korsakov, Ketnet Unidamu and Jelle Cleymans). We refrain from having screens in the car, and since both of our children get car sick quite easily there’s not a lot of difficulty in doing that. or one of the 1000’s of other variations, which shouldn’t be too surprising if you have ever driven more than 15 minutes with children in the car. When we were planning this year’s drive, we were looking for ways to engage our children more, find a way for them to understand better that we really had to sit in the car for a whole day, and that Austria was a little further away than a neighbouring town. In the past, we tried showing them a paper map or making a list of all major cities we had to pass, which we would tick off when we passed them. This was interesting for us, as grown ups, but made little sense in our children’s brain. Perhaps our oldest daughter would start to understand what maps are about, but our youngest (4 y/o) has no clue at all. So this year, we landed on a new concept – an idea that sparked in my wife’s mind and was developed further. The fundamental idea is really simple, but since we figured it has so much potential and possibilities to be interpreted in other ways – it makes sense to elaborate a bit. The general idea is to visualise your car’s position on a ‘timeline’ indicating distance. So one end of the line is ‘home’ and the other end is ‘arrival’. This visualisation should be present at all times in the car, and updated frequently (ideally by the person in the passenger seat). 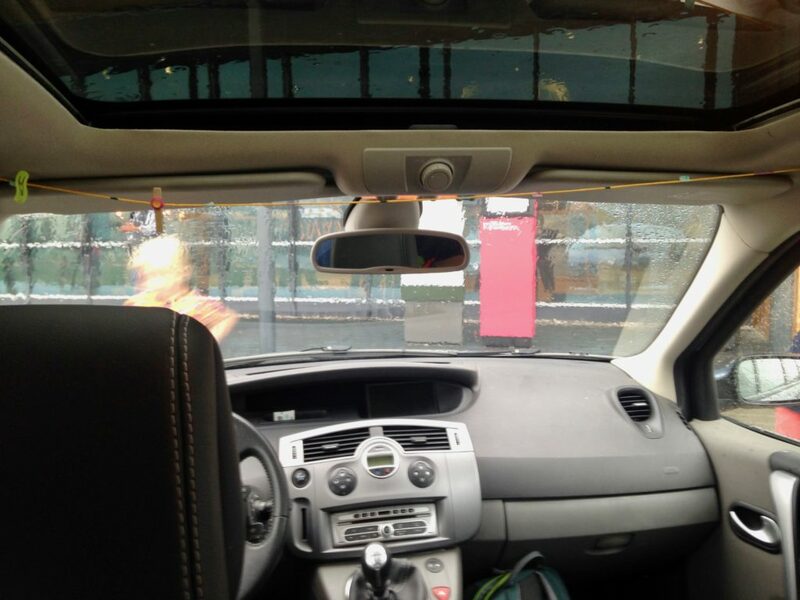 Starting position, as seen from the back seat. Indicator is at the left hand side (0km). Each marker represents 100km in this example. As the journey progresses, the indicator moves. Everyone in the car can see which distance has been covered and which distance is still to go. As you get closer to your destination, it is visually clear to everyone in the car that you are indeed getting closer, but that there is still some distance to go. You can use visual markers to indicate each section (eg. every 100km), or place a marker at the halfway point etc. This seemed like a good idea. 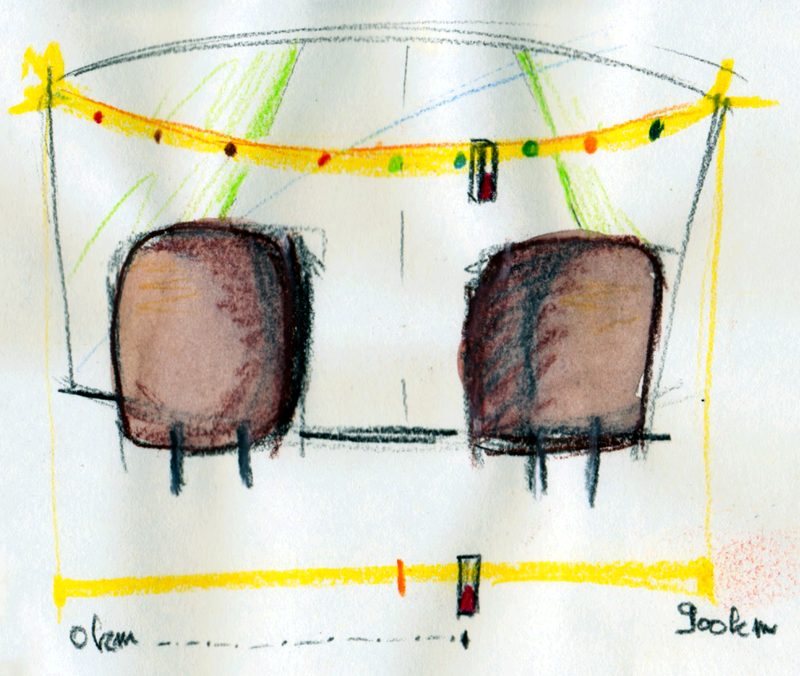 Obviously, I was thinking about making a device that could be connected to the satnav system and show the car’s position on an RGB led strip. 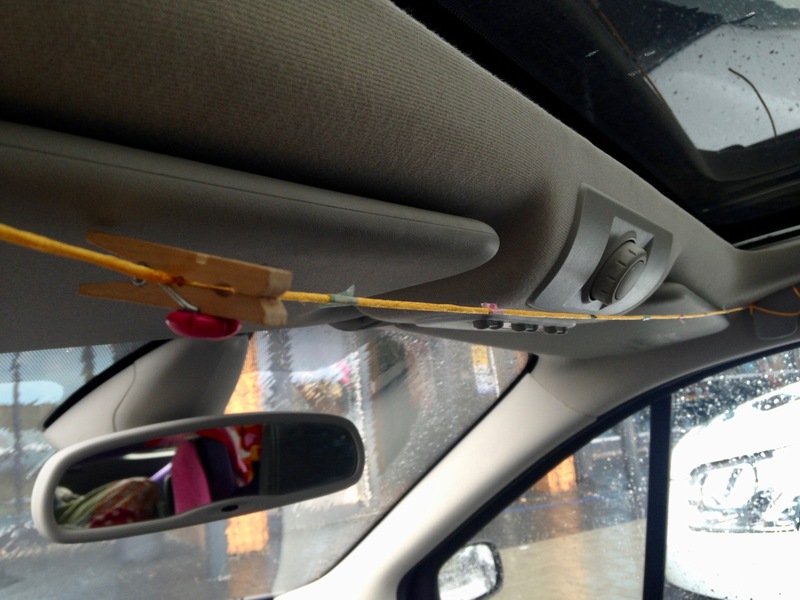 Enter my wife, who decided to go low fidelity first – and put up a piece of string in our car. The indicator we used to try this out was a clothes peg. We added little pieces of coloured tape as a way to indicate every 100km. My wife would move the clothes peg every so many kilometers, based on the ‘distance to destination’ on our car’s satnav system. Overall, it was great! We didn’t really know whether our 4 year old would ‘get it’ – but being able to tell her that there’s still this much ‘string’ to cover and that we already covered this other amount seemed to ease her mind during the drive. We did notice that when you get closer to the destination, it would make more sense to have a more fine grained way to illustrate the distance to go. Perhaps it would make the distance scale used logarithmic instead of linear. In that case, the clothes peg could move more clearly in the last 100 – 200 kilometers. Couldn’t you just make an app, like on long distance flights? What was important for us was to have a ‘glanceable’ interface, which made sense for everyone in the car. Although that this could probably be achieved with some kind of screen based device, using a smartphone or tablet app, our goal was to have something that would be present at all times, would not cry for attention and would be easy enough to understand for ages 4 and up. Also, when making this prototype, we figured this needed to be a ‘social’ thing – something that could be experienced with the family together and not an individual something. Having this in the car as a ‘manual analogue’ device really helps in achieving this, as it is a physically tangible thing. Something you can point to and pull at. Waze integration: get a feel for traffic or other events on your route Driving with friends: see you friends on the same route Pre-planned events: based on POI data the route could be ‘gamified’ – eg: find a big tower at this location. On our way back home, we tested one of these ideas. My parents were driving home too on the same day, but set out to leave later. We added a second indicator (a hair clip this time) to our piece of string and asked my parents to update their distance-to-arrival every so often. This turned out to be fun, just to have a feel for where they were. At one point they were in heavy traffic, they were not really advancing in any way. This got us to look up alternative routes for them, as we ‘felt’ a lot closer to what they were experiencing. View from the back seat, at the start of our trip home. Our car is the clothes peg, my parent’s car is represented by the yellow hair pin. It would be nice to know if this idea resonates with anyone reading this. Feel free to think along! Are we there yet? by Are we there yet concept is licensed under a Creative Commons Attribution-NonCommercial 4.0 International License. Today (May 17th) is #IDAHOT – the International Day Against Homophobia, Transphobia and Biphobia and I put out a rainbow flag. I rarely put out flags or publicly show signs of what I believe or relate to (ie. political parties, national celebrations etc…). But today is different. Over the past year, maybe two years, my sensitivity for overall ‘respect’ in our society has skyrocketed. Maybe this is because I’m watching my children grow up, maybe it is because my social circles have changed somewhat over the past years – unsure. But I seem to be confronted with inequality of varying kinds, not just related to gender issues – but between people in general. I believe there is a need for people to respect each other, listen with empathy, and have an attitude of ‘accepting’ in life. I admire most creative people and most creative efforts because I like the idea that they’re doing something. Even if it’s crap, I like the idea that they’re doing something. Several people I talked to radically disagree with this statement. I still don’t. The reason I find this statement so powerful is that it reminds me that people put effort and belief/soul in the things they do. I believe we should not be judging any of that upfront. For example, when I stroll along amateur arts stalls on a local arts and crafts market, I might not feel particularly triggered by the art on sale – but the fact that people spend time being there should be respected. I believe this is often undervalued, people are judged at first sight, things are judged without actually looking at them. This morning, I put out my rainbow flag to stress that we should not be judging. Don’t take me wrong, we can and should have opinions. We should debate, talk and converse on and offline. But I would prefer to ‘bail out’ of any conversation that is anchored in assumptions, prejudice or any form of ‘keeping up appearances’. I would like to focus my time and energy on constructive conversation and collaborative work in an unconditional way. Remember that time I requested my personal data collected by my supermarket? I think I owe society an update, since the whole story ended rather positively compared to what the previous post might suggest. After sending a registered letter to my supermarket, stating clearly that I was requesting my data as a natural person, I got sent a pile of paper with all my purchases since 2006. Check out a sample here. Let’s recap the goal first. I thought it would be a nice experiment to see how easy it would be to request a copy of my personal data kept by the supermarket I frequent most. The previous part to this story ended in the more philosophical explanation why I wanted to go through all the hassle, being an attempt to build my personal API. In the same post, I concluded rather negatively. I went through quite a bit of communication with my supermarket’s customer service, which initially resulted in some miscommunication from my end related to requesting info as a natural person. I included a separate (new) request for a copy of my personal data and included a copy of my (Belgian) passport. In this letter, I also referred to the European legislation on data privacy. I was somewhat lucky that at the time of sending the letter, the legislation just went through a significant update – making it more clear how personal data should be treated from a European point of view. For completeness, a copy of the letters I sent can be found here. Not that long after I sent the registered letter, I received a large brown enveloppe through the mail, containing all my purchase data at my supermarket from 2011 onwards. This data included a full detail of all my purchases, item names, prices, where I shopped, how much I spent in total, etc. Check out a sample of the data here. In the end, I was really happy with how this turned out. Looking back, this has been an extremely educative journey. I got to understand privacy law a little better, learned that this piece of legislation mostly applies to natural persons and developed a better sense for data privacy overall. I received the data at the start of the summer holidays, and haven’t done anything with it since. This is mostly because my initial attempts at OCR-ing the scanned data turned out to be harder than I thought. Initially, I wanted to contact my supermarket again to request a digital copy – but figured that they were probably sending me the data on paper for some purpose. At the moment, I’m regarding the OCR process as a next challenge. Once that is done, I hope to build some kind of ‘Feltron report inspired’ dashboard of my supermarket purchase behaviour. But since the whole data processing and visualising is all very new to me, it is taking me some time to understand what I’m doing. Watch this space. Be more clear in communication. I had the feeling the customer service person was being treated as someone who had to clean up the dirty work. One email I got included a copy paste out of another (internal) email, which was not friendly at all. My current understanding of the situation is that the online customer service does not really know how to handle requests like this, which slows down communication terribly. Don’t send me paper. In the pile of paper I received, there were a couple of pages of screenshots out of internal Colruyt software. This forces me to believe that the internal software is unable to export data to a more universal format. Also, I wonder why I received all data printed on paper in the first place. I didn’t explicitly request a digital copy, for sure, but knowing that Colruyt greatly values the environment, it surprised me to receive a pile of processed trees. Transparency. 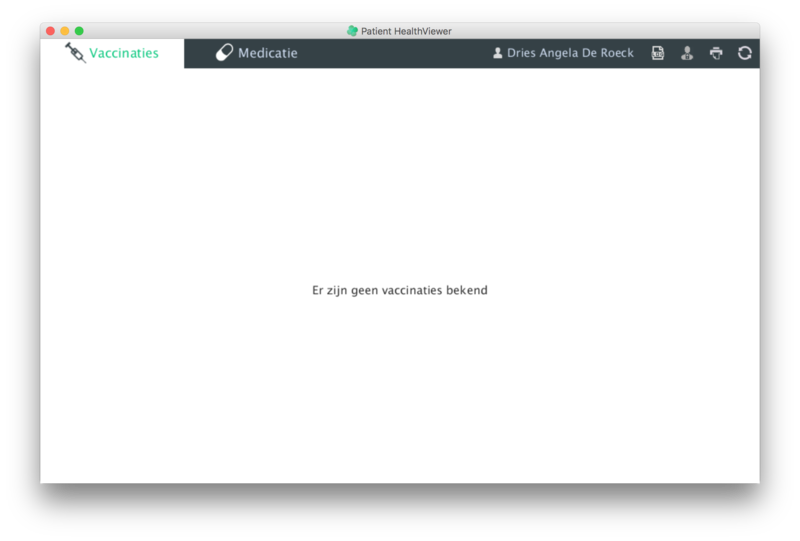 What I love about Colruyt is the transparency towards customers. Prices in shops are constantly updated, comparisons are made with other supermarkets in the area, etc. Suppose that the organisation could push this level of transparency through to a personal level, by ideally giving everyone access to a personal data portal or similar, would set a clear example for others on a national and international scale. Although this might be a utopia, it would clearly show that you, as a supermarket, deeply respect your customers. 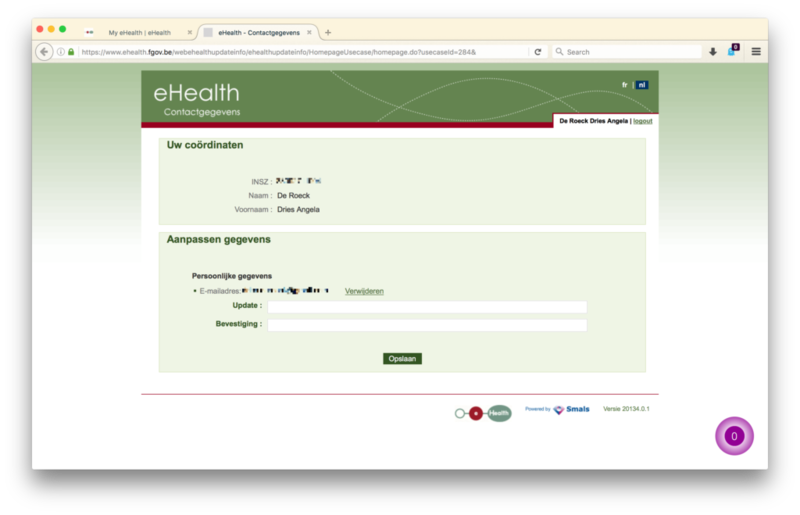 In a previous post, I talked about my endeavours through the ehealth data portal of the Belgian government. Somewhat related is another journey I recently started, during which my end goal is to consult the data my favourite supermarket collects about me. 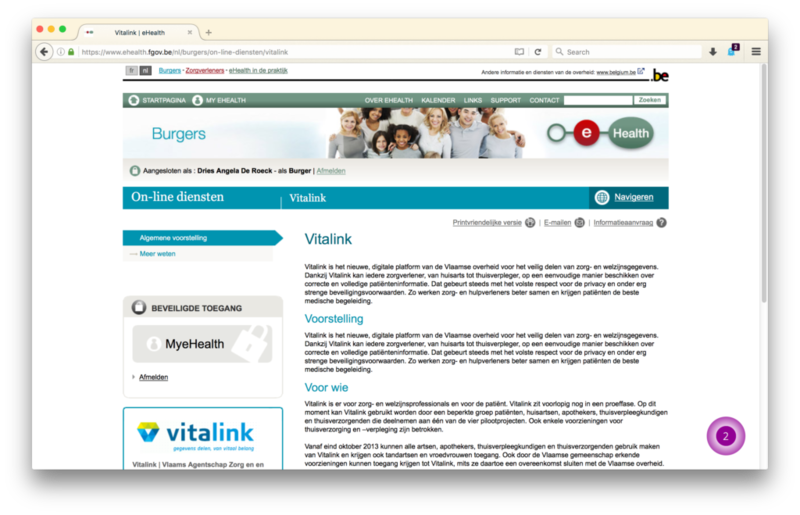 This post is a first one in a series describing my experiences regarding a request to consult the data gathered by the Belgian supermarket Colruyt about me as a natural person. After making a first ‘official’ request via email (signed letter + copy of my passport to prove my identity). I got a snail mail reply stating that they only have data about me as a legal entity, I called BS and re-requested my data specifically stating that I want to get insight into my purchase data they use to send me personalised advertisement. (aka my purchase history linked to my loyalty/bonus card) Current status : waiting for a new reply (4 weeks and counting). People have been asking me why I go through all this hassle, to set that clear once and for all – I want to actively contribute in generating awareness of where and how data is collected. I took on this active stance after hearing Estelle Massé (Access Now) and Prof. Preneel (K.U. Leuven) talking about the lack of understanding of data privacy & ethics and the emerging cry for cryptopolicy. The flurry of thought that emerged in my head was a willingness to understand this better – and what can be a better way to learn than to actually figure it out while doing it? Regarding privacy, ethical data policies and related ‘whatevers’ I’m an utter n00b, n44b, newbie. The more that I think about this though, the more I feel the need for governments, companies and organisations to actively think about a data policy and the protection thereof. The increasing interest of Blockchain technology is just one indication that having access to (personal) data will become a very important part of how the economical systems of tomorrow will work. Actually being able to access that data, and act upon it, seems to still be the missing link. Regarding public data (weather, traffic, pollution, demographics,…) I have the feeling we will eventually get to some kind of addressable ‘API’. The worldwide open data initiatives are a good example of this, and some cities are taking a forerunner role in this already (London, Ghent, Helsinki amongst others). When it comes to personal data, I’m still very much in doubt how we will or can evolve to a ‘personal API’. In my previous post on ehealth, I had some doubts regarding the accessibility of my own health data. I clearly could not access everything, which is (still) very confusing to me. I know that governments are doing a lot of efforts to demystify the data available, when I’m speaking for Belgium I’m always surprised (and happy) to see the correctness of the prefilled fields on my tax application. However, at the same time I realise that the process to actually ‘find’ this data is so cumbersome very few people actually make the effort to consult it. That being said, I didn’t mention anything about all data available that is scattered throughout a variety of privately owned services. Social media profiles, online photo archives, webshops, data linked to loyalty cards at small or large stores, etc. For the moment, I assume that the governmentally controlled data will become available in a usable format at some point. It will probably still take a couple of legislations, but we’ll get there. 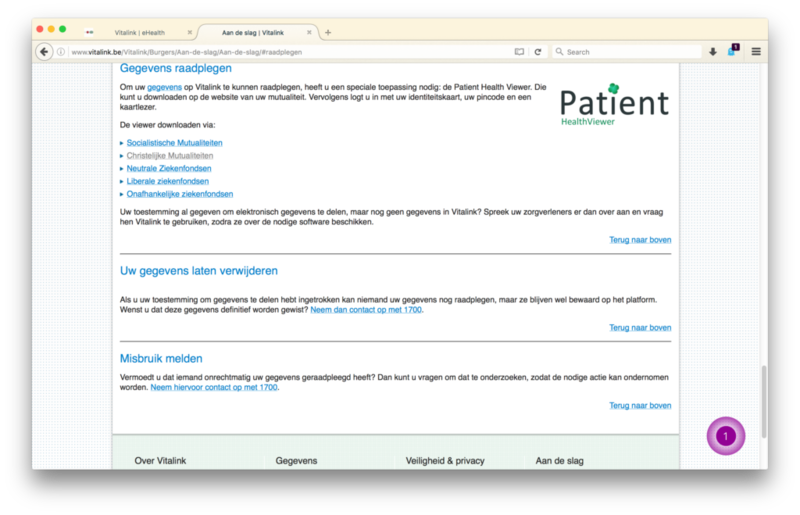 The first things I did (on March 29, 2016) was email the customer service of Colruyt, refer to the article in their privacy charter and request a copy of my data. I got a very swift reply asking me to send a copy of my passport to prove my identity and send a more formal, signed, letter. I followed all advice, got a confirmation that everything was going to be processed and that I would receive a printed copy of my data anytime soon. Although that I found it a little odd that they were going to send me the data on paper, I was actually really happy at that point. A smooth transaction, sound and clear. A couple of weeks later, I find a (printed) letter in my mailbox from Colruyt. After reading it, I was flabbergasted and furious at the same time. The letter stated that they could not share the data because they only have data about me as a legal entity. At that point, I really wondered why I sent a copy of my passport and a signed letter in my own name. I never mentioned any legal entity, let alone that I ever bought any groceries on my company name. After showing the letter to a couple of friends, we all concluded that this very much felt like they were trying to find reasons not to share the data. After receiving that letter, and regaining a sane state, I sent a friendly reply mentioning that I never made any mention of a legal entity and always had the intention to request my own purchase data (as a natural person). Since then, I was in contact with Colruyt customer support about two times – requesting a status update. Each time, they replied in a very friendly way that they were working on it and would get back to me shortly. Since the last communication dates from June 1st, I figured that after four weeks it was time to take a next step. Short term, I’m very much looking forward to the new response from Colruyt. I’m starting to get a little worried whether a new reply will follow at all, it would be very unfortunate having to take more formal steps in this request. I have sent out a registered letter to their customer service today, referring to all previous communication as well as a clear request to receive all stored data about my purchases. (ie. the data they use to create targeted advertisement). In that letter I made reference to some articles of the EU privacy law, as well as to their own privacy charter. I find it a pity to take this step, but I’m not going to let go right now. The longer term plans originate from a talk over lunch with @nielshendriks @karinslegers and @liesbit about 5 years ago. The idea brought to the table then was to create a website that would automate the data requesting process for a selected amount of companies. That would mean that after entering all required data, letters would be generated and sent out to the companies automatically. This ‘service’ would ideally take out the hassle of carrying out a person’s right to access personal data and could be an intermediary step towards the personal API. Last Friday I had a regular health checkup, nothing too spectacular. It was the first time my doctor mentioned that I had to decide whether I was ok with giving other health related entities access to my medical file. I asked him whether I could access this information myself, my doctor replied : “yeah, probably if you google it you will find something”. 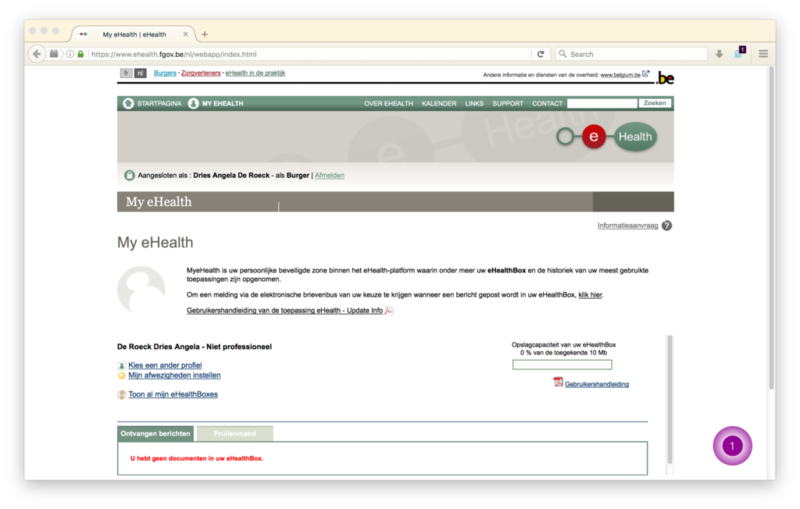 Indeed, there seemed to be a Belgian governmental e-health site. This all seemed very regular and boring, but once I started to look for my actual medical file I was totally blown away that they put something like this online. The most excellent example of making something that is not accessible by anyone, but is supposed to serve many. Since the whole ‘experience’ was rather shocking, I want to take the time to go through (part) of the process using screenshots, in a mere 18 easy steps (not). 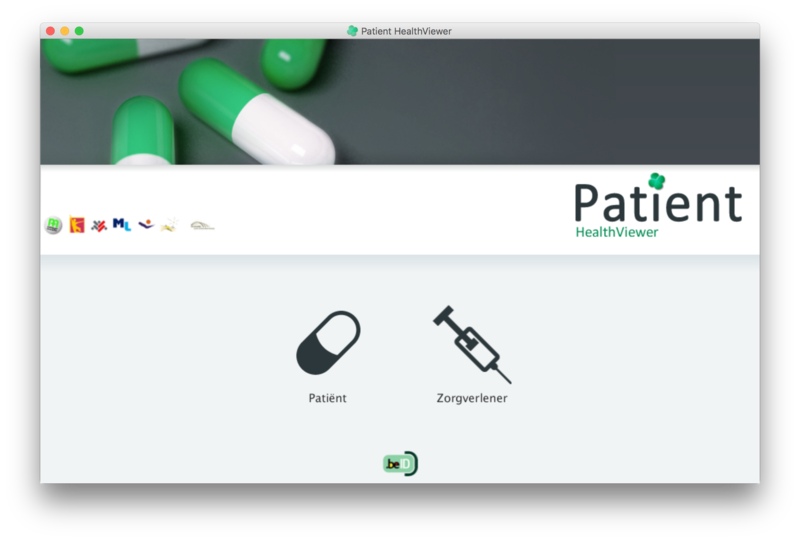 In order to access my shared medical file, I had to install java, a middleware application, a cardreader driver, a firefox extension, go through three websites, one pdf document, install an application from an unregistered developer and enter the pincode of my e-id card. If you are not a computer person, you’ll never get to see your medical file. During the process I would expect a constant feeling of security, yet the design of this ‘flow’ could be optimised in so many ways. I’m very much an advocate of ‘don’t complain, suggest what’s better’ – but this time … I honestly wouldn’t know where to start. Before logging in, I needed to make sure I could log in to governmental services. In Belgium this is done using an e-id. In order to do so, you need some middleware software, a cardreader and the correct drivers for that cardreader. Ow yes, you also need a recent version of java, and preferably you’d be using Firefox with the e-id firefox extension installed. Suppose that you’d get through all that, you’re good to go! After logging in on the ehealth portal, this is where you end up. A rather unstructured site, with seemingly unrelated content. When looking for my medical file, I’d figure I could find some pointers via my personal information. Turns out the personal info section links to a site with a totally different design where I can only update my email address. Weird. Going back to the homepage, I end up here. An overview of ‘services’, described in a very cryptic way. I’m still not sure what the difference between eHealthConsent and patientConsent is. 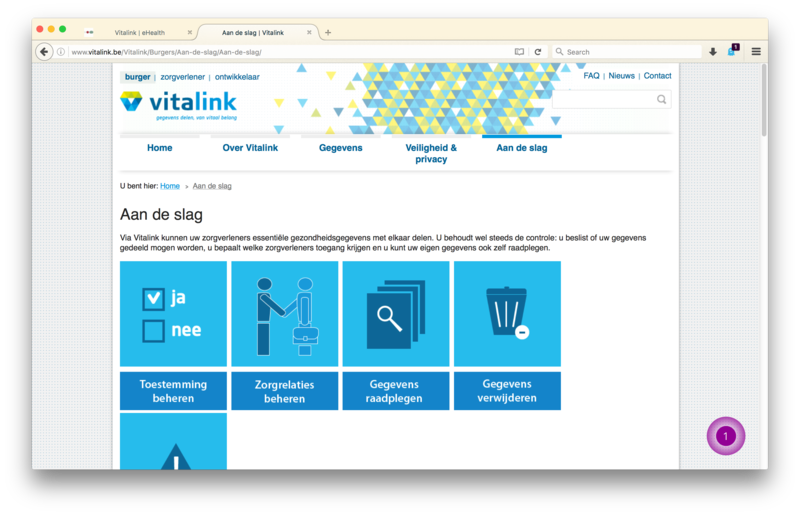 After more cryptic text, this Vitalink thing seemed to be hinting towards what I was looking for : my shared online medical file. Yay! Almost there .. I figured. 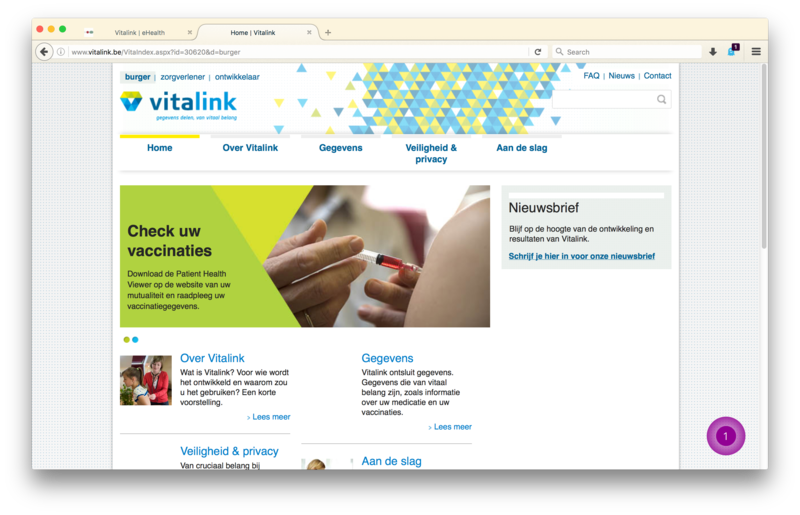 Okay, the vitalink homepage. This seems to be a place to figure out where to get info on my vaccinations and such – that sounds like my medical file! Step 7: Let’s do this! After spotting the ‘aan de slag’ (to work) button – I thought I was really getting close. There was even a ‘consult your data’ button (the one with the magnifying glass), exactly what I needed. At this point, I’m very confused. This is the third organisation I have to go through in order to access my governmentally owned health record. Or, is it not owned by the government after all? 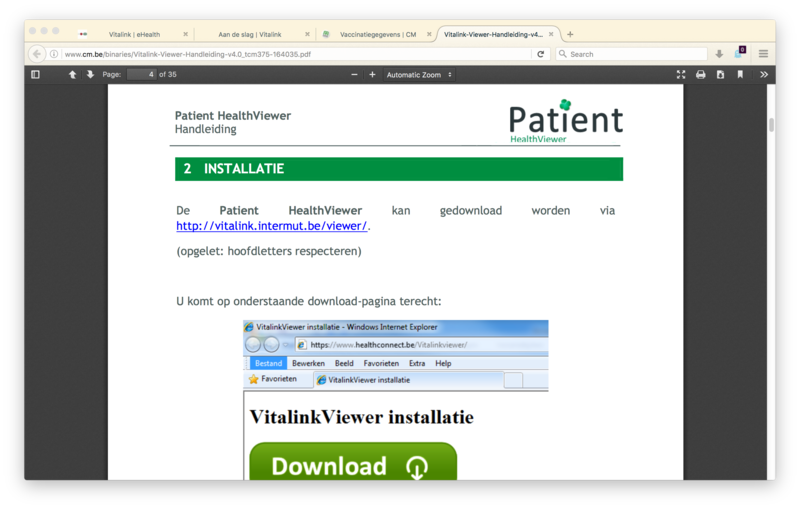 Nevertheless, I’m pushing on – I find a link to install the software on my the website of my health insurer. Step 10: What!? A .pdf? I get presented with a PDF. A manual in a way, or perhaps a procedure … I’m not sure. I start reading through it. 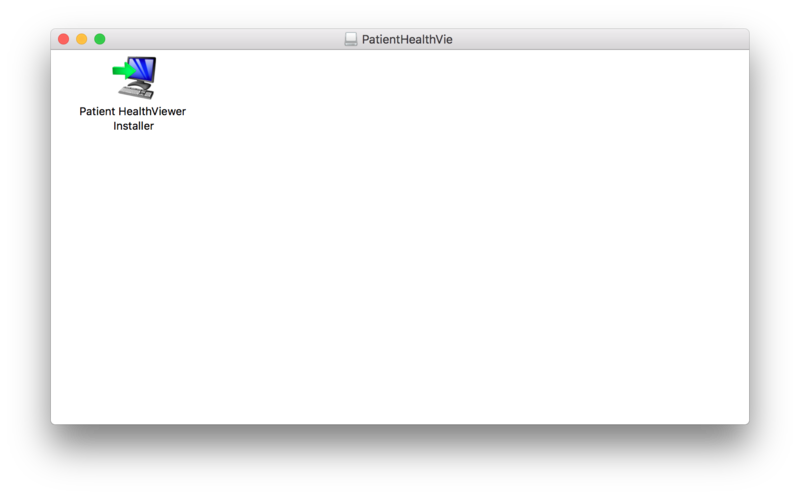 It is an instructional manual of the ‘HealthViewer’ application, which is the thing I need to access my medical file. 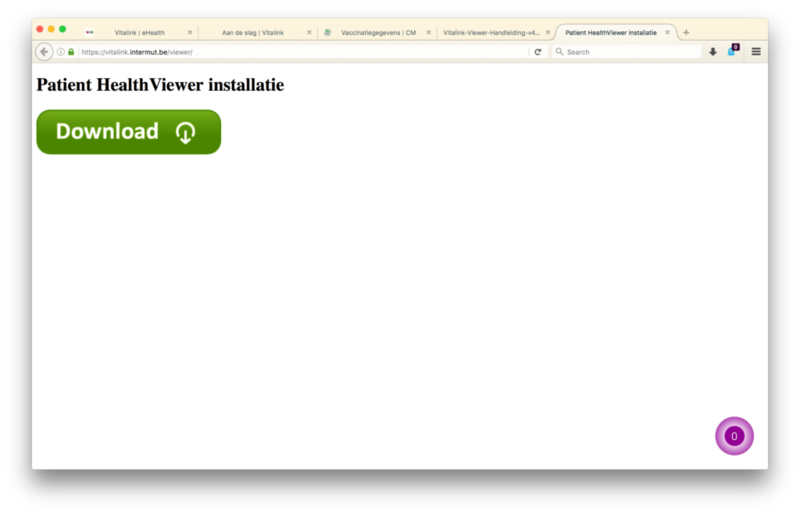 I scroll down to the installation instructions. Another link, to an organisation called intermut. Whatever. I laugh at the comment ‘this URL is case sensitive’. Step 12: Sure this isn’t spam? After clicking the link in the .pdf document, I end up here. This looks very dodgy, almost like one of those odd illegal filesharing popups. Nevertheless, I click the big green button. A .dmg file starts downloading. Okay, nearing completion of this quest! Yes, I want to install the software – don’t really like installers on OSX, but not giving up now! My-o-my, unidentified developer. 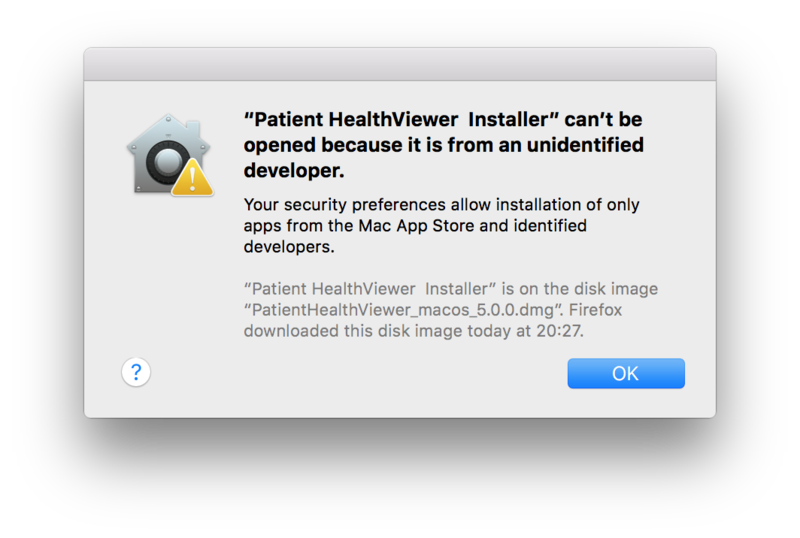 Seriously, if I’d be a less savvy OSX user – this would have been the end. In this case, I right click the installer and manage to get past this screen. Yes, we’re finally good to go. 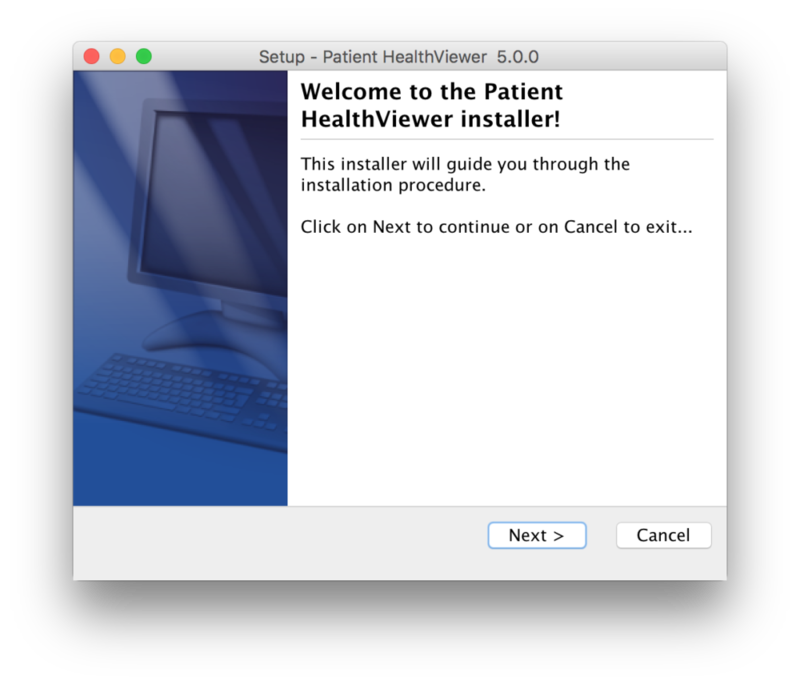 Although that I haven’t seen this installer screen in a very long time – did I just timetravel to 1999? 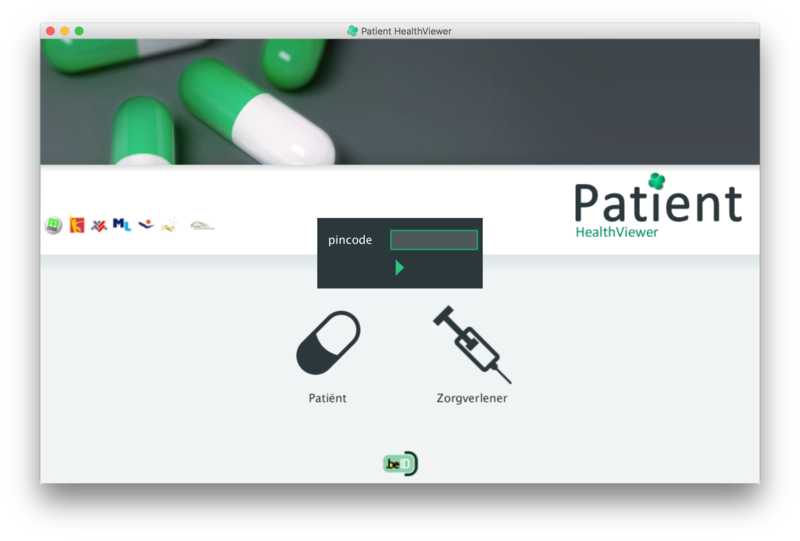 Despite all previous steps, the software opens. It is very lowres on this retina screen. But at least I can finally log in. I make sure my eID middleware software is running and that my eID card is inserted in the cardreader … because you never know. I get promted with a textbox asking my for a pincode. What pincode? The pincode of this software? Or that of my medical file? Does that even have a pincode? … I figured it might just be asking the pincode of my eID card. Behold my medical file. Nice and empty. 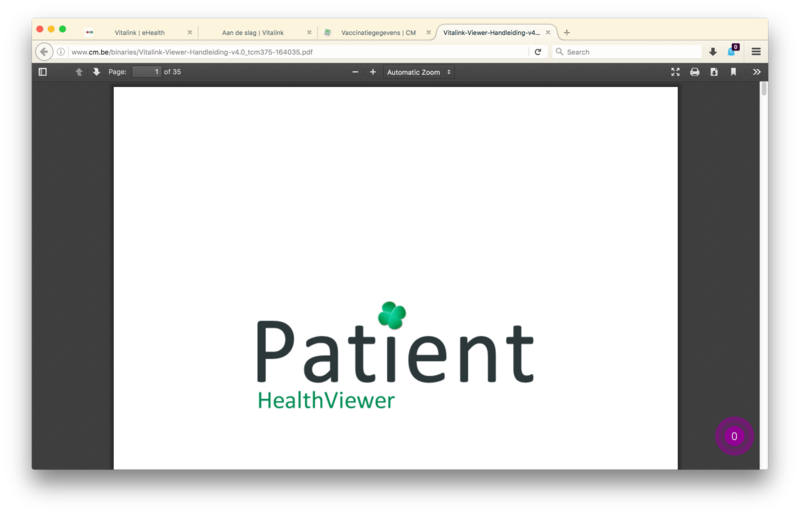 I know there should be 2 entries there somewhere, but somewhere else I found out that as a patient I can’t access my Sumehr (Summarized Electronic Health Record). Strange, again. 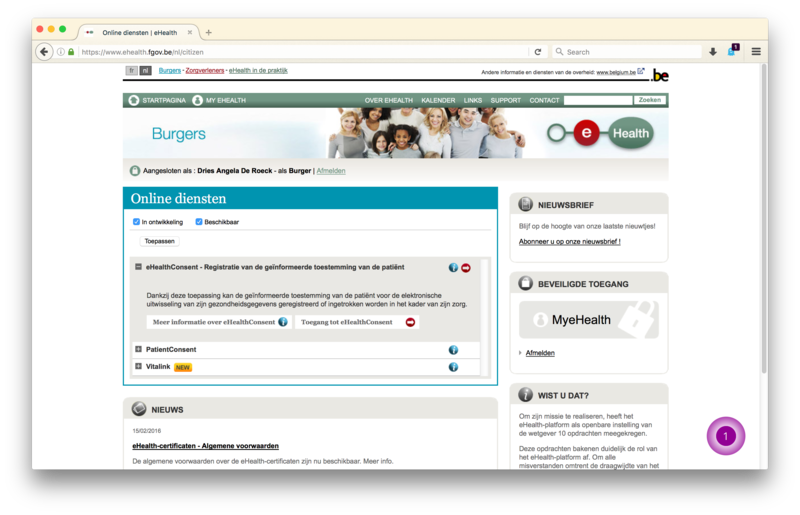 I totally see the advantage of an online ehealth system. 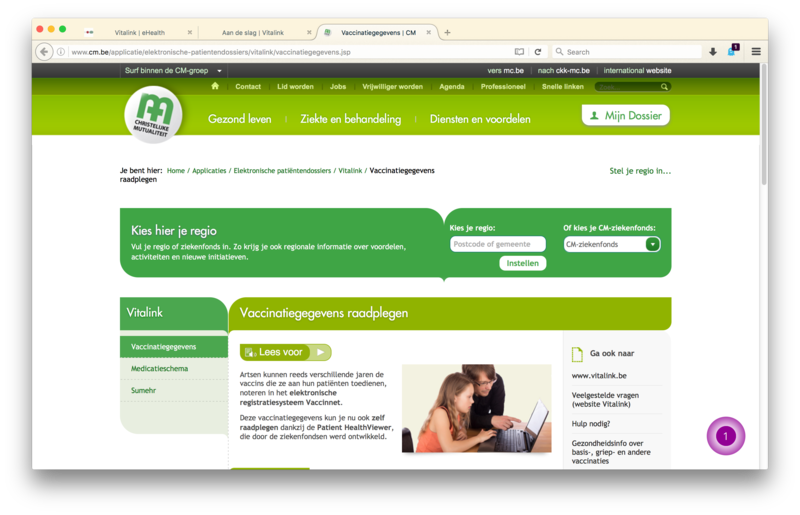 I can imagine the Belgian government worked hard to get this online, and integrate various governmental agencies, databases and other entities. But experience wise, there’s so much wrong in this flow. Nothing is clear, nor are there attempts other than long pieces of text to explain what is needed at what time. A seriously missed opportunity, but on the other hand … a very interesting evolution. I’m sure we’ll get there, some day, in a galaxy far far away.